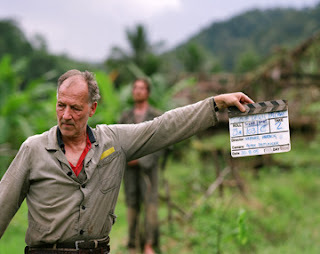 Werner Herzog has a totally different perspective on filmmaking than virtually any other contemporary director. He is demanding and uncompromising to the extreme, especially when it comes to insisting that everything seen on the screen is authentic, not some special effects wizardry or state-of-the-art CGI trick. It is the difference between art and science -- something that Lucas or Spielberg, for example, simply do not understand. Or, more likely, simply something too darn arduous for these wussies (vs. Wookiees) to pursue. Of course, that's par for the course for almost all of the current crop of "New Age" directors who don't like getting down and dirty. It is this devotion to absolute authenticity that makes Herzog so fascinating and admirable, especially since he is the first into the danger zone himself. A river teeming with poisonous snakes? Herzog takes the plunge ahead of everyone else. A bowl of swarming live maggots to be eaten? Herzog is the first with a spoon. A scene where the lead character must bite into a live seven-foot long snake? Yes, Werner shows the way. RESCUE DAWN is the incredible, true story of Lt. Dieter Dengler, the only American POW to have escaped from a Laotian prison camp and make it to safety. It is a powerful, uplifting tale of personal survival against all odds that explores the power of the human spirit to overcome even the most devastating and hopeless of circumstances. Under Herzog's skilled direction, coupled with his inabiliy to compromise on even the most agonizing and torturous dangers facing cast and crew, RESCUE DAWN is possibly the most harrowingly realistic and unsentimental of all prisoner-of-war epics. The virtually impenetrable jungle is real, the giant leeches covering the actors are real, the ant nest strapped to the face of Dengler is real -- there's no sound stage or computer graphics department to be found anywhere. Hell, in true Herzog fashion, there isn't even a honey wagon. As with all of his other films, Herzog's casting choices are flawless. 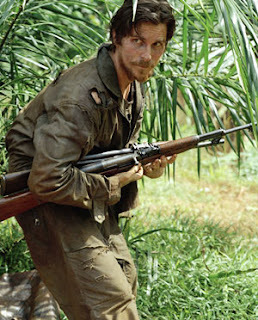 Christian Bale plays Lt. Dengler -- his performance is riveting. Yes, the "American Psycho" is perfect in his totally unique, captivating portrayal of a born leader with an indomitable spirit. Think Candide, not Rambo, and you'll be close. 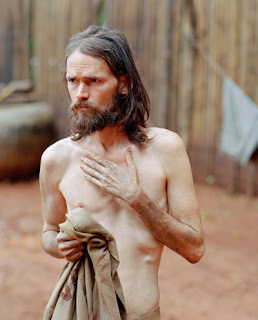 Equally stunning is the work of Steve Zahn as Duane and Jeremy Davies as Gene, the most emaciated of all the prisoners. You will not soon forget this terrific trifecta -- that's a bet I can't lose. But the true star is, of course, Herzog. If you have seen AGUIRRE, THE WRATH OF GOD you know what I mean. The same for FITZCARRALDO, WHERE THE GREEN ANTS DREAM, FATA MORGANA, EVERY MAN FOR HIMSELF AND GOD AGAINST ALL or any one of the other fifty films he has directed. 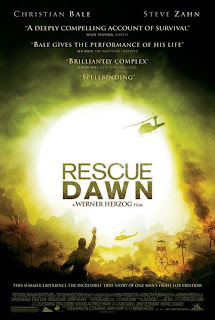 RESCUE DAWN is similarly unforgettable thanks, once again, to Herzog's consummate cinematic skill, visceral vision and his uncompromising, primative approach to "keeping it real."